Pickled eggs are great for picnics or parties. They are very easy to make. Large jar with a COATED or PLASTIC screw-on lid (do not use a plain metal lid or your pickled eggs will not keep properly). Simmer the vineegar with the ginger, mustard seed and peppercorns for 5 minutes. Strain (optional) and let cool. 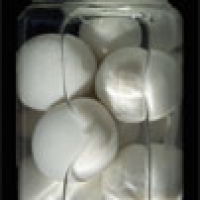 Arrange the eggs upright in a large jar that has a COATED or plastic screw-on lid. Place jalapenos on top of the eggs. Cover eggs with the vinegar and tightly screw on the llid. Label, using a piece of clear tape, with the contents and date. Let eggs set for 2 - 3 weeks before using. A great '5' recipe.. Love it. Is the ginger that's called for, ground ginger or fresh ginger?